Anthony Weber | Troy Daily News School Resource Officer Nick Freisthler practices safety in and around a school bus with participants Wednesday during Safe-T-Town at the Troy Junior High School. 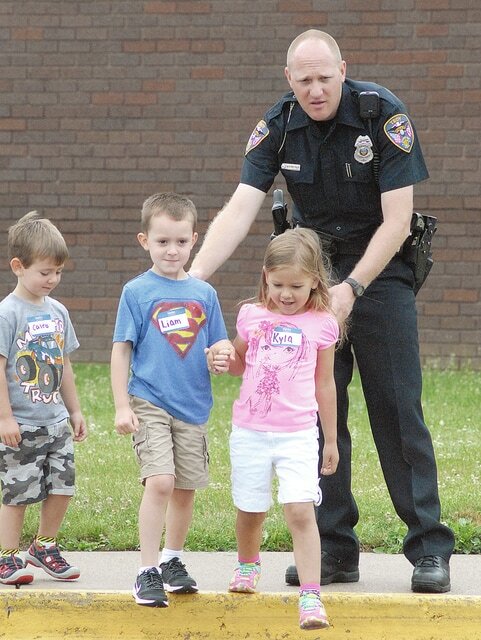 Safe-T-Town is a week long camp conducted by the Troy Police Department offering four and five year olds training and information on various safety topics. Anthony Weber | Troy Daily News School Resource Officer Nick Freisthler discusses the danger zone, fifteen feet around a school bus, during Safe-T-Town Wednesday at the Troy Junior High School. Safe-T-Town is a week long program conducted by the Troy Police Department offering four and five year olds training and information on various safety topics. TROY — The wheels on the bus remained stationary, but the wheels on the Big Wheels went round and round. The Safe-T-Town program takes 100 children, ages four to five years old and in preschool, and teaches them about safety. Troy Police Department Officer Nick Freisthler is the school resource officer for the elementary schools of Troy City Schools. He said that the age of the students is perfect for the program. “A lot of them are in preschool, so we’re getting them used to walking to school or riding the bus to school and that’s the reason why we do it at this age,” he said. Alongside officer Jeff Waite, the day starts off with classroom instruction either through YouTube videos or Powerpoint presentations. The students learn about stoplights through songs, and then for the other half of the class they do something interactive to practice what they’ve learned. Safe-T-Town includes a replica of a town with wooden houses. The students walk on mats in a replica town, cross at white lines, the motorists ride the big wheels around so the pedestrians know to watch out for cars and then the motorists know what stop signs, yield signs, all those different signs are for when they are on the road. On Wednesday, the kids learned about school bus safety, which included a trip to the school bus to get on and then exit through the emergency exit with the help of Freisthler. After the school bus trip, the students hopped on the big wheels to cruise around Safety Town. Thursday’s topic is safe places to play and Friday’s is gun safety. Upon graduation, each student get their hand painted and leave their hand print on the houses. Freisthler said the handprints span back to 2012, and that watching the current class recognize a big brother or sister’s handprint is always exciting. Student Hunter McLaughlin said his favorite time of the day was indoors. “We got to go so fast on the big wheels, and it was a lot of fun,” he said. Student Sterling Altman agreed on the big wheels. “I liked that we got to turn fast on the streets,” he said. The city of Troy sponsors the event along with the Troy Police Department. Safety Town also receives a grant from the Troy Foundation for the annual summer program.